Well, the results are in, and yours truly brought it in under 5!! OH yeah! This weekend, after 6 months of training, Team Burbank descended on the City of Sin to achieve the impressive - finishing a marathon. Or half a marathon if you're nasty. 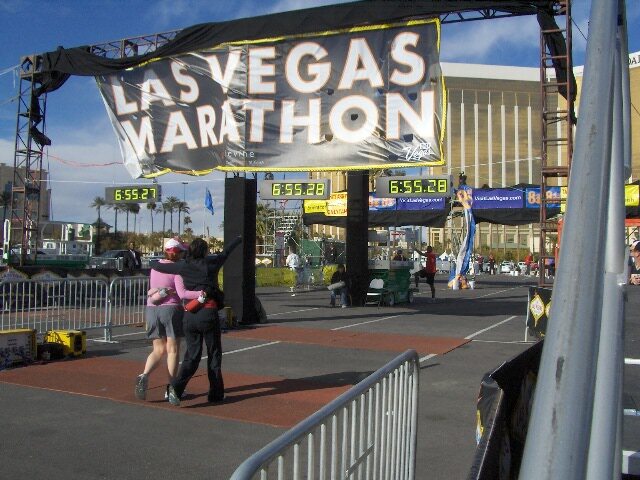 The New Las Vegas marathon, at 26.2 miles, is quite an event. 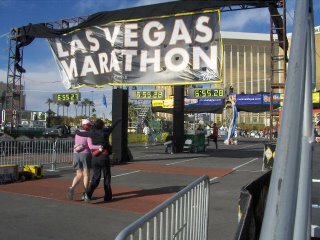 We started at 6am and ran down the entire Vegas strip, past the seedy wedding chapels where several marathon couples got married while being witnessed by Running Elvises. Kept chugging along into Downtown, where the slots still take coins and give 'em back if you're lucky, and then off into the low-rent industrial side of town where the 8 mph winds tried to slow us down. But this baby wasn't about to back down. My goal was to beat my old time, 5:17:15, but I never dreamed I would actually be able to bring it in under 5 hours until after the halfway point when I realized I had time to spare. I averaged 11 minute miles THE WHOLE WAY. Except for the 12th mile which took me a little longer thanks to my hobo squat in the bushes. But even that didn't slow me down much, I even had to stop myself from running back onto the course while pulling up my pants. My mom and dad came to watch me, and said I looked bulletproof when I crossed the finish line. I felt bulletproof. I don't know if I'll ever do another marathon - it's HELL on your body. But man, there are some seriously inspiring moments in an event like this. A guy in a wheelchair who walks the last 200m with a walker. The cancer patient who reminded me as she crossed the finish line that there are much harder battles being fought everyday. It made me marvel at the decision to put yourself through such a trial. There's no real reason to accomplish such a feat, and yet thousands of people chose to do it, and did so sometimes at great cost. My friend Anni, another member of Team Burbank, also finished the full marathon, and sits at home as we speak soaking the socks off of her bloodied feet. In spite of the fact that she sustained an injury at mile 16, she fought it out to the finish walking the rest of the way (see pic). Maybe we do it just for the chance to be inspired. Maybe you never truly learn something until you live it. In the Honolulu marathon I found out that when your body feels fear or doubt, it will use your subconcious to manipulate your behavior. For example, when my body wanted to quit, I started hearing voices in my head telling me I was a bad actor. That I was a failure. Usually when I start having thoughts like these, I get sad, and I GO TAKE A NAP... Ah HA! Caught you in the act, subconcious! You'll never fool me again with your tricks. This time, I found the truth behind the concept of mind over body. I see now where someone's willpower can actually sustain them beyond reasonable limits. It's the type of power that can make a father survive in the snow for so many days in order to try and save his family. My limits weren't tested quite so far, but I certainly saw the potential. Even as everything in my body told me it was time to walk, I kept running. On pure willpower. My quads have been reminding me of my tyrannical method ever since. Its times like these when I question the need for stairs. You know when you fart in a crowded department store, and then dash off to some remote location where a person would stand who couldn't possibly be responsible for the impending chaos? Do you wait a moment and then return to the scene of the crime to see if the damage was as serious as you imagined? Thats kind of how I feel about my last post. Now, don't think I'm backing down from my latest scheme - I do intend to pursue a path of writing, although I don't know how much longer my enthusiasm will fuel the ship. It's just that I was feeling a bit heady when I most recently blogged, and you can't imagine how shy I feel now. I haven't been back to this blog in... what, a few weeks? I didn't even read the kindest comments from Tommy and Laura until tonight. (PS, Tommy, the answer is a resounding Yes). I was planning on writing a blog about how excited I am to be flying off to Vegas for the marathon in a few days, and then I remembered: oh yeah, I farted here. And people know about it. They are even trying to pretend like my idea doesn't stink. I've heard that a good rule to follow when you are trying to quit smoking is to tell everyone that you're quitting. Makes you more responsible to your commitment. You should have heard the number of friends I told at Thanksgiving - hey, I'm going to pursue a writing career. And they all smiled and patted me on the back: "Great idea, Tara." I have very supportive, terse friends. Unfortunately they also have good memories. 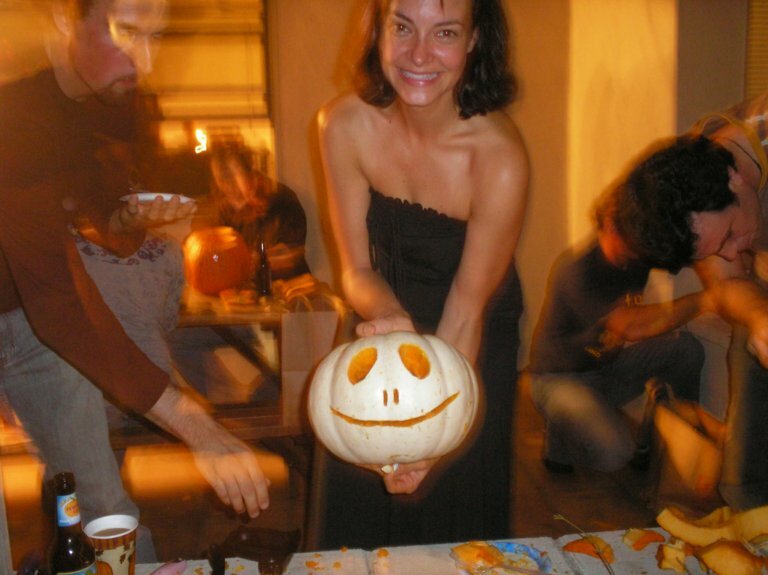 Between this blog and Thanksgiving, I guess I'd better at least give writing a try. So why does it feel like I can't form a sentence? Suddenly its painfully obvious to me that I can't type, I am obssesed with commas, and I'm not an alcoholic. So, crap, I've got a lot of work to do. I guess this rambling post was just a series of observations on a new adventure. I would also like to state for the record that I always thought the writer in the family was my sister, and I still do. In conclusion, I would like to restate my thesis in the context of the bigger picture of life: I think farts are hilarious and worth writing about. July 1995 - August 2006. Banister Allouiscious Cretin the Third turned up missing this past August, having not returned home for his afternoon feeding at his residence in Seminole, AL where his caretakers Mom and Dad Ochs live. Bane Kitty, as he was known by most, was the smartest, coolest kitty that ever lived. He was born in Tallahassee, FL, abandoned to a pet store along with his brothers and sisters. 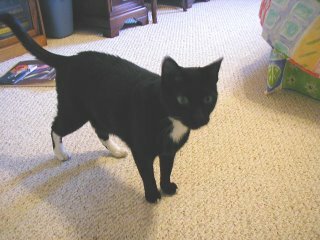 My college roommates Melissa and Michelle rescued him for the price of a litter box and some gravel. He was given his many names by all three of us, but the concensus was that he most resembled his first name, Bane. He croaked like a parrot because he was part Siamese, and from his first days it was obvious that he would spend his 9 lives well. When Bane was not even a year old, he was hit by a car and broke his hind leg. He went into hiding for a few days where he contracted a severe cold and some nasty flea bites. When he finally returned, he was barely recognizable. It was the same summer that I was in London, so he was cared for by Michelle, Emily, Joe, and a few other friends. He walked around the house in a pink leg cast, with a cone around his head. Bane would soon become familiar with "the cone". When I returned to FSU the next year, Bane and I were a permanent pair. I officially adopted him from my other roommates, and we moved into the home of Tom, Lauren, Tanya and Mary Jane. Along with five people, Bane became fast friends with 7+ dogs, 5 other cats, two ferrets, two finches (one of whom he finally ate), and several fish. It was thanks to Lauren's vet skills that we discovered Bane's limp was the result of bad surgery - there was still a pin in his foot which should have been removed! Once the pin was removed, Bane seemed to recover like Lance Armstrong. (Or maybe we should say Lance would later recover like Bane.) The rest of Bane's life at FSU was fun-filled, and he met two of his best kitty friends, Thurston and Annabelle. When I graduated from FSU, Bane traveled with me to Atlanta. It was here that he met his other best friend, Alex. They were fun-loving wrestling kitties, and even made a short film together. It was also in Atlanta that Bane first started to show signs of his life-long illness, Feline Herpes. It was during these many outbreaks that Bane would become truly familiar with "the cone", as his infections would develop in his eyes, eventually leaving him half blind. But Bane never lost his sense of adventure. He got to know my brother Jay for a few months by sitting on his lap while watching Survivor. He also loved his kitty-sitter Chad, on whom he played a great practical joke: for the week I was out of town, Alex pretended he was Bane and came in every day to eat while Bane went out partying on the town. For the whole week Chad fed Alex instead of Bane! When it was time for me to move to LA, it was clear that Bane's health was delicate, and his best place was at the beautiful one-acre riverside home of my parents. It was here that Bane lived out the rest of his days, perhaps his happiest, ruling the woods of Seminole, AL. He was very well cared for by Dad, Mom, Laura and sometimes Jack and Helen. It was Jack and Helen's chihuahua Taco who was Bane's best friend in his later years. They would meet each other in the morning and walk around together, and even share food. When I came home this past Labor Day weekend, Bane was gone. We don't know where he went to hide, but the last few days he was seen, he had stopped eating. Had he stayed home just one more day, he would have made it to the vet, but sometimes Kitties know better than we do. Perhaps Bane has just gone off to other adventures like he often did, and will return, but I have a feeling he's gone on the greatest adventure of all. RIP Bane Kitty. You will be missed. Hi and welcome to my new blogsite, friends and family! Its going to take me a few days to get all of this up and running, but after realizing that I could blog for free, I've been chomping at the bit to stick it to those Typepad fools. Silly me, thinking I had to pay somebody to host my blog - it was costing me $4.46 a month! And for what? Its not even as cool as this blogspot site. And my fear of losing past entries or readers is ridiculous - I don't do this for you people, I do it for me!! So from now on, if you want my news, its FREE! OK, so it was always free for you, but now its free for me, too. Next up, changing my long-owned email address so I don't have to pay six bucks a month just to keep it. Piracy, this internet business is! !